Author of a large collection of responsa; flourished in Turkey in the first half of the sixteenth century. His occupation was that of a merchant ("Benjamin Ze'eb," p. 14b), but he also served as a member of the rabbinical college of Arta (vilayet Yanina). In rabbinical literature he is known chiefly through his disputes with many of his contemporaries, which were caused by the great independence he very often displayed in his decisions on legal questions, an independence that greatly offended the rabbinical authorities. His collection of responsa, "Benjamin Ze'eb" (Venice, 1539), which he published partly in selfjustification, was not at all well received by the Italian and Polish rabbis of the time (compare Solomon b. Jehiel Luria, in "Yam Shel Shelomoh," 3b on B. Ḳ. viii., No. 72). The work, containing 450 responsa on the most diverse subjects, throws an interesting light on the intellectual as well as the social status of the Jews of that time in European Turkey and in Asia Minor. For instance, Benjamin's ordinance against men and women dancing together met with great resistance, many young people refusing to obey this puritanical precept ("Benjamin Ze'eb," pp. 228b et seq.). 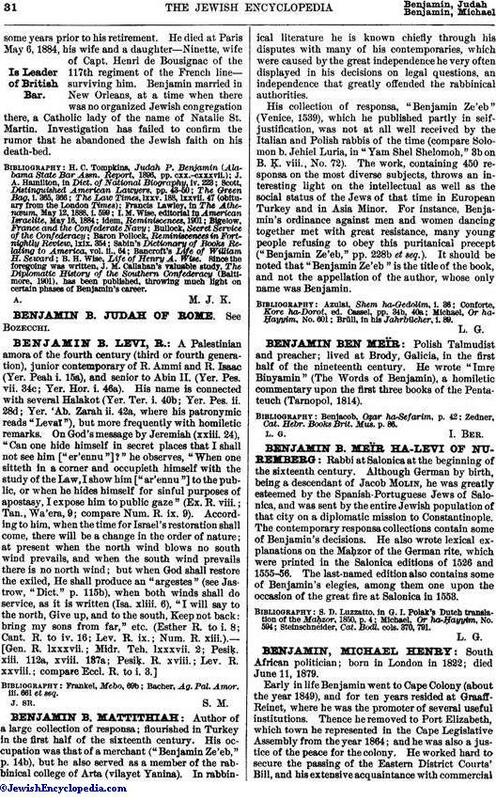 It should be noted that "Benjamin Ze'eb" is the title of the book, and not the appellation of the author, whose only name was Benjamin. Brüll, in his Jahrbücher, i. 89.